Circus Mirandus by Cassie Beasley. Dial, 2015, 292 pages. Syllabus: Notes from an Accidental Professor by Lynda Barry. Drawn and Quarterly, 2014, 200 pages. I am just an eensy bit excited. goes in a whole new direction. 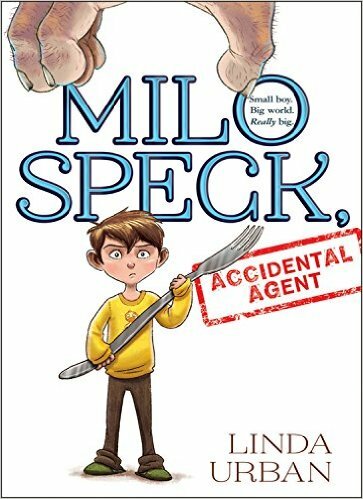 Milo Speck: Accidental Agent by Linda Urban. Harcourt, 2015, 272 pages. The Nest by Kenneth Oppel, illustrated by Jon Klassen. S&S, 2015, 256 pages. Pop Goes the Circus (Three-Ring Rascals #4) by Kate Klise and M. Sarah Klise. Algonquin, 2015, 144 pages. The Loch Ness Punster (43 Old Cemetery Road #7) by Kate Klise and M. Sarah Klise. Harcourt, 2015, 144 pages. Gone Crazy in Alabama by Rita Williams-Garcia. Amistad, 2015, 304 pages. Grunge nostalgia . . .
Tomboy: A Graphic Memoir by Liz Prince. Zest Books, 2014, 256 pages. by Tom Angleberger. Amulet, 2015, 144 pages; 160 pages.